Home On Leave, a Norman Rockwell painting, appeared on the cover of The Saturday Evening Post published September 15, 1945. This is another favorite of Rockwell collectors, a classic enduring image of the world Rockwell painted. 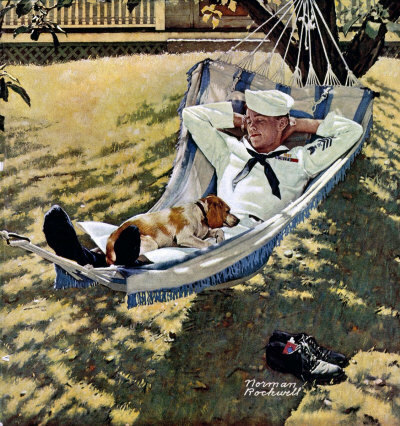 An alternate title for this painting is Sailor in Hammock. This painting was Rockwell's 231st overall out of 322 total paintings that were published on the cover of the Saturday Evening Post. Rockwell's career with the Post spanned 47 years, from his first cover illustration, Boy With Baby Carriage in 1916 to his last, Portrait of John F. Kennedy, in 1963. This was also the fifth cover for The Post in 1945. In 1945, there were ten Norman Rockwell Saturday Evening Post covers published. The original oil on canvas painting, 28 x 27 inches or 71 x 68.5 cm, is part of a private collection. The original painting sold for $4,520,000 at auction on May 23, 2007 at Sotheby's in New York City. on page 161 of Norman Rockwell, A Definitive Catalogue by Laurie Norton Moffatt. In this painting, Norman Rockwell shows us a typical 1945 military scene. How great is it to be home? Well, just one look at this sailor tells us that Rockwell had not forgotten his World War One service. The war was over by the publication of this painting on the Post cover in 1945. The Germans had surrendered on May 7th and the Axis power to surrender was Japan on August 15th. So this sailor had earned a well deserved leave to visit home. Home On Leave was only one of 322 Norman Rockwell Saturday Evening Post covers; Here is the list of Norman Rockwell Saturday Evening Post cover illustrations. Well, we can be sure that this hammock was not his first stop. There is no doubt that he gave Mom a hug and shook hands with Dad. If he has any siblings, hugs, kisses and handshakes were dispensed all around. He has kicked off his shoes and is enjoying a nap in the safety of home. Do You Have A Great Story, Opinion Or Contribution About Home on Leave?